Ah yes... the film series that made famous the inspirational musical montage arrives on Blu-ray Disc at last, and what a welcome addition to the high-def catalog it is! After so many years and so many fights, you’d think there’s no way that Rocky could still be the underdog, and yet if the character ever fought a single round in which he didn’t have some adversity he had to come from behind to heroically surmount, I haven’t seen it. 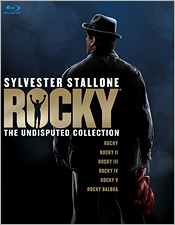 The original Rocky, the script for which was written by Sylvester Stallone, is an undisputed, Oscar-winning classic. It’s followed by entries in which the champ fights Apollo Creed (again), Mr. T (er... Clubber Lang), the gigantic Ivan Drago and his own ego, in a four-film stretch that ranges from good to campy, and is always predictable but enjoyable. Thankfully, the recent final film in the series, Rocky Balboa (directed by Stallone himself), manages to be almost as good as the original and is a fitting bookend to the series. MGM’s new Undisputed Collection includes all 6 films in the series. 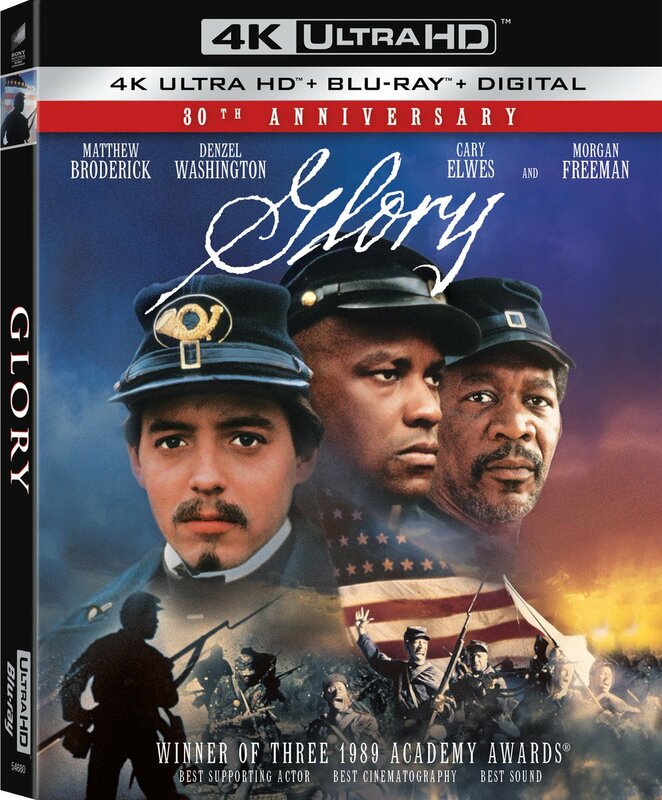 I should mention that the original Rocky disc included in this set is the same movie-only version that was released on Blu-ray back in 2006. Likewise, the Rocky Balboa disc here is the same version released more recently by Sony on Blu-ray (and reviewed here on The Bits). My hats off to whoever was responsible for these transfers. These films have never looked better. Given their age and the late 70s/early 80s era in which most of them were shot, you can’t expect perfection. Color is a bit muted, there are occasional contrast issues and print nicks and you’re going to see moderate film grain in the image (as you should) – these are just facts of life for films made during this period, and the fact is, these films are supposed to look a little gritty and working class. But let me tell you... every single bit of detail that’s present in these negatives has made it into these transfers. The textures are nuanced and subtle – everything from skin tones, to clothing, to the dirty brick and iron of Rocky’s working class neighborhood. The images are remarkably crisp and clean. Every one of these transfers looks wonderfully film-like and natural. The audio mixes, presented in DTS-HD MA 5.1 lossless (except Sony’s Rocky Balboa disc which features terrific uncompressed PCM 5.1 lossless audio), offer surprisingly wide front soundstages with light surround play most apparent during fight scenes. Clarity and fidelity are good, and Bill Conti’s stirring music sounds fantastic. When Conti’s classic theme begins to trumpet as Rocky begins his requisite training regimen in each film, you’ll want to cheer. The mixes occasional reveal their vintage in that they aren’t quite as smooth and natural as more recent films, but that said, there’s little doubt that these films sound as good as they ever have. In terms of extras, there’s both good and bad news. This set is SO close to being the ultimate edition of these films that it’s maddening. But it ain’t quite there. Films I though V are essentially movie only, but this set includes a bonus disc featuring all of the trailers for the films (including the Rocky Balboa trailer that Sony couldn’t be bothered to include on their Blu-ray), and the fact is that films II though V never had any bonus features on DVD anyway. What’s more, the Blu-ray bonus disc includes all of the featurettes and documentaries from the original Rocky: Special Edition DVD, as well as the 2-disc DVD Collector’s Edition. The only thing that’s missing video-wise is the Rocky Balboa preview featurette from the 2-disc Rocky CE and a trailer for the Rocky Legends videogame. Neither is really missed. If you had the 5-disc Rocky Anthology DVD box set, that set also include a bonus disc (in a cardboard sleeve) containing an episode of A&E’s Biography featuring Stallone – the episode is missing from the Blu-ray set so be sure to keep it if you want it. The one thing that’s missing from the new Blu-ray set that really matters, however, are all three audio commentaries from the 2-disc Rocky CE (including one with director John Avildsen and another with Stallone). That is such a huge omission! Unfortunately, in the early days of Blu-ray MGM and Fox were in the habit of releasing great films on the format as movie-only editions. And I suspect that, having already authored Rocky on the format once, they didn’t want to spend the money to do it again to add the commentaries. To be fair, it may also be that they don’t have the rights to include them anymore, or there’s some other legal or contractual reason why they couldn’t be included. Either way, the fact that these commentaries are missing is the one thing that keeps this new Blu-ray set from being a true home run. Or more appropriately, a knock-out punch. For my part though, I simply took Disc One of the Rocky CE and the Biography disc, put them in paper sleeves and tucked them into the Blu-ray case. Problem solved.